The Women's version of the Dynafit TLT6 Mountain boot is no less robust than the men's. Although it has a Custom Ready liner with a women's specific fit and slightly lower profile, the TLT6 Mountain Women's CR uses the same shell mold, cuff, and sole. A slightly softer tongues gives a more progressive flex for women and a Grilamid lower shell lightens it up. It has the same impressive combination of agility and performance that evolved from the renowned TLT5. Its ease of use and adjustability make it one of the most complete ski mountaineering boots on the market. 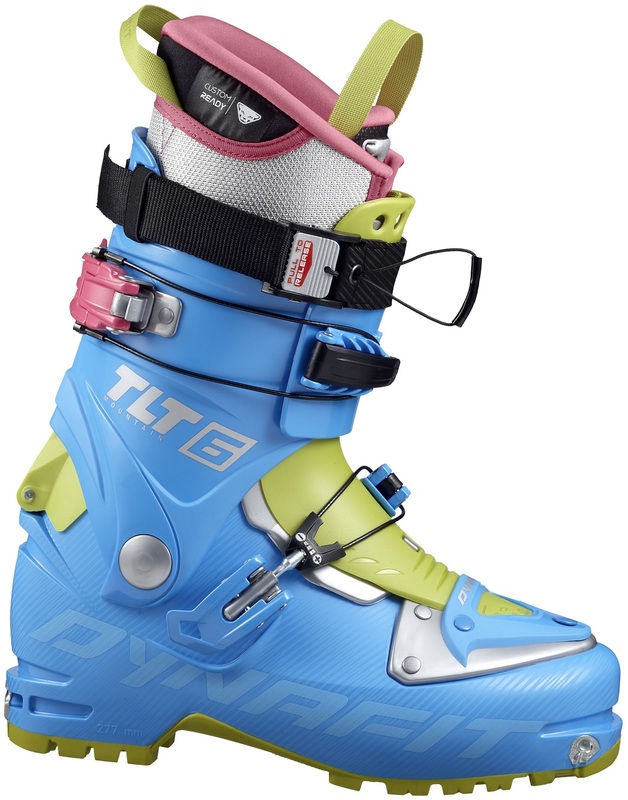 And if you haven't used a TLT boot before you will quickly come to love the one-motion Ultra-Lock System that combines closing the top buckle with locking into ski mode, a big time saver during transitions. Slightly wider, more comfortable last makes this boot fit even more women's feet than the TLT5. There is now a buckle articulation on the Ultra-Lock System 2.0 which can reduce lateral snags during transitions. TLT6 Custom Ready Women's liner (237g/8.4oz) is now warmer due to reflective aluminum foil and is made for out-of-the-box comfort. Avoid any heel lift or slop by micro-adjusting the new instep buckle to get the perfect fit. The Driving Spoiler has been upgraded to 2.0, which makes it slide more smoothly in walk mode while will locking things down for skiing. Adjust the forward lean (15° or 18°) to your skiing style by an easy flip of a new metal spoiler insert. Enjoy maximum agility while walking or climbing with the proven compact, rockered design of the TLT Grilamid shell. Grip your lower leg firmly with the patent-pending toothed buckle catches that are designed to prevent unintentional releases. Claw Outsoles are super grippy due to a sticky yet durable compound placed in the heel and toe of the boot. Get into your skis quickly with the patented Dynafit Quick-Step inserts that are notched to guide the toe pins into place. Update 2015/16: Hot new colors and power strap make the latest iteration of the TLT6 the best yet. The Ultra Lock strap can be tightened by pulling on the webbing (no Velcro). Then pull the cord for a quick-release and be ready for the next uphill. Otherwise unchanged. Please note the sizes listed at a lower price are the 2014/15 white model. Note the TLT6 uses the same sizing as the TLT5 in the size chart. Notes Renowned TLT with women's specific fit and Grilamid cuff for an intermediate stiffness. Bottom Line Functional and versatile ski mountaineering boot. any difference between these and the white model of women's tlt6 mountain cr?? 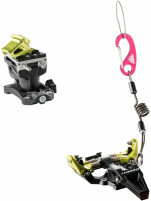 Hi Emily, the colors were updated from the white model and also it got an improved quick-release power strap. I got these for a family member, and have yet to hear any complaints-- and they barely fit me (with a men's 8 a 24.5 is alpine- race- tight). The soles have worn well so far, and the skiing is a big improvement over the original TLT5s. If you are looking for something that skis well and isn't as pricey (or are just generally scared of first year boot designs), these are a good alternative to snazzy new boots. Is there a big différence between the women model and the other TLT6 at 499$ ? Hi Marie-Eve, There are a few small differences between the womens tlt6 and the green (mens) tlt6. The back of liner on the womens is little lower and the boot comes with the soft tongue. The green tlt6 ( mens) comes with a stiffer tongue and the liner is not cut down in the back. Other than that the 2 boots are the same. Same fit, same materials, same buckles. Hi Tony, unfortunately not. The TLT series only works with Dynafit-style tech bindings. A very pretty, light, simple boot, with plenty support for the downhill run. Three complaints: the switch from ski to walk involves leaving the top strap open. It is hard to get your pants cuff over the open buckle. Second: to change the forward lean requires removing the boots, getting out a screwdriver (star drive), and carefully (don't drop anything!) removing two screws, holding on to the threaded barrels, flipping the metal insert over, and reinserting the screws. Major, major PITA in the field. Thus, you are effectively limited to one lean position while touring. To not have the lean angles field-adjustable is a big WTF?!? And third: there is no attachement point for runaway leashes. Which is pretty ironic, considering that Dynafit includes a set of leashes with their tech bindings, but does not have any dedicated point on their boots to them clip to. Don't feel bad though, Dynafiddle, no other boots do either! All in all, these are some very sweet boots, and can be found for very reasonable prices on the web. Have any ladies skied this boot? What are your thoughts? Are they comfortable, warm and stiff enough on the steeps? I purchased this boot for my wife since it appears to be the lightest women-specific boot that comes in a 22.5 mondo size. The lighter and smaller you are the more the weight on your feet matters. I know a few women whose husbands convinced them to buy burly backcountry rigs and ended up thinking (rightly so) that backcountry skiing is a lot of suffering for just a little fun. This boot with appropriate skis and bindings should change all that and I doubt anyone will notice much of a performance difference. My wife has a womens 5 US shoe sized foot and she is ecstatic with this boot's fit. She claims it is perfect without molding or shims and loves the articulation in walk mode. My wife paired these with Dynafit PDG skis and Speed Radical bindings which seemed to be plenty light and the binding provided release settings that seemed more appropriate for lighter individuals. Even though the PDG is a race ski, for a smaller folks, our thinking is that you just dont need 100+ width under foot. Obviously a personal thing there but the light weight for a small person is a big consideration. My wife is small and about "advanced intermediate" ability-wise. The boot has been plenty stiff and small folks just shouldnt need a lot of buckles and stiffness so it appears the boot will not in any way limit her. Also, since she is small, she just doesnt have the weight to beat these up and plans on using them as her only boot in area as well as backcountry. She has only skied it a few times but I thought it was worth posting a review as this boot may well be the ticket for a lot of women out there with smaller feet and there is not much said about this consideration on boot reviews.